Here is the Vimeo recording of the school deliberative session, Feb. 6th, 2014. These are comments from Sandown residents who took the time to write notes of appreciation to my husband and me for our efforts at Deliberative. We are most grateful for the support and continued encouragement. I’m sharing them so the world can see the depth of concern in our community. Thank you for all your hard work. It is too bad so many don’t see the truth. I pay over $5,000 in real estate taxes but have no vote in Sandown because we no longer live there. I have rented my house because I was unable to sell it for $175,000 when we paid over $244,000 for it. Please keep up the fight for the town. Your dedication is greatly appreciated. I want to thank you and Arthur for all the work you put into your presentation last night. You fought a good fight and I hope that the “for the children” crowd will not deter you from continuing to educate those of us that are not dialed in so we can spread the word and try to end the culture of endless money and bloated administrations. I would like to work on this to understand how to redirect the costs and get control as a community. We are in a dire situation. Our property values will continue to fall, we have one of the worst markets in Rockingham county. Still no rebound, still lots of foreclosures and this will continue and drive down values. We want to take this time to thank you for efforts on behalf of the tax payers of Sandown, they were greatly appreciated. It was dishearting that more people from Sandown did not show up to support your effort. Perhaps after another tax increase they will finally get it. Thank you for standing up for the residents of Sandown. Taxes are out of control and I watched the [budget committee] meeting and nobody cared at all about being fiscally conservative at all, except for you. They just keep giving you the runaround. It was sickening to watch. Typical big government tactics. Keep up the pressure. Wish we had a lot more like you! THANK YOU ALL! These are serious issues that can be tackled if we work together. Our strong showing at Deliberative was heard by the administration. In an inspiring show of force, nearly 300 Sandown residents streamed into the Timberlane Performing Arts Center last night to have their say on the Timberlane budget. At one point the voter registration line for Sandown was so long that it stretched into the parking lot. Deliberations had to be delayed by 45 minutes while the supervisors of the checklist gave out voter cards, some of which had to be borrowed from another town, so great was the demand. Thank you, Sandown, for your show of strength and your active concern about the school budget. Not all of you voted to reduce the budget, but many of you probably attended your fist school deliberative and for that I am very happy. The district needs the feedback of taxpayers. We should not be spending piles of your money in complete obscurity. The night held plenty of excitement for the 700 registered voters. First there was the shocking lie by the school board and administration that their budget is up just 2.2% when it is up 4%, but that was a lie known mostly to people sitting on the stage who did nothing to disabuse the audience. Then a motion was made by my husband, Arthur Green, to lower the budget by $2.5 million. After my prepared presentation on the rapidly falling enrollment but the even more rapidly rising budget, and a pitch to cut things that would have no classroom impact, some lively debate followed. Ultimately the motion was defeated 372-239. My husband has been sick in bed ever since though I think it is due to a cold and not sheer discouragement. Then a gentlemen running for school board, Mr. Sapia, made a motion to raise the budget by $750,000 to buy new astro truf for the high school. That went down in flames as will his candidacy, I hope. Last year at Deliberative, Mr. Sapia got $150,000 added to the budget for new lawn equipment and sod care. One can only wonder what will become of our grounds once his son graduates. People in Sandown are saying they can’t sell their homes because taxes are too high and the school district is not well regarded, but not enough people in the auditorium shared our desperation. Come next December when feeling helpless indignation at your tax bills, you will know that you at least, did your best to save public education from its own gluttonous demise which will come when people can no longer afford to have children. Our fight was about affordable education. Education the taxpayers can afford. Our district has ample resources. I know. I see all the underspent lines on the budget. Why do we give the school district a blank cheque every year with no accountability for the quality of their education? NECAP scores in math and reading were down in 2013. Our SAT scores are terrible, our AP courses have just 50% of students getting 3 or above when the state average is 75%. Yet we keep shoveling money into the furnace when we should be opening windows to get some fresh air. Money is not going to solve our problems. If it could, it would have already. But money could very well be the ruin of us. These charts are a little too small to easily read here. (Come to School Deliberative Session on Thursday night to see more.) The first chart below starts at 2007 and ends at 2015. 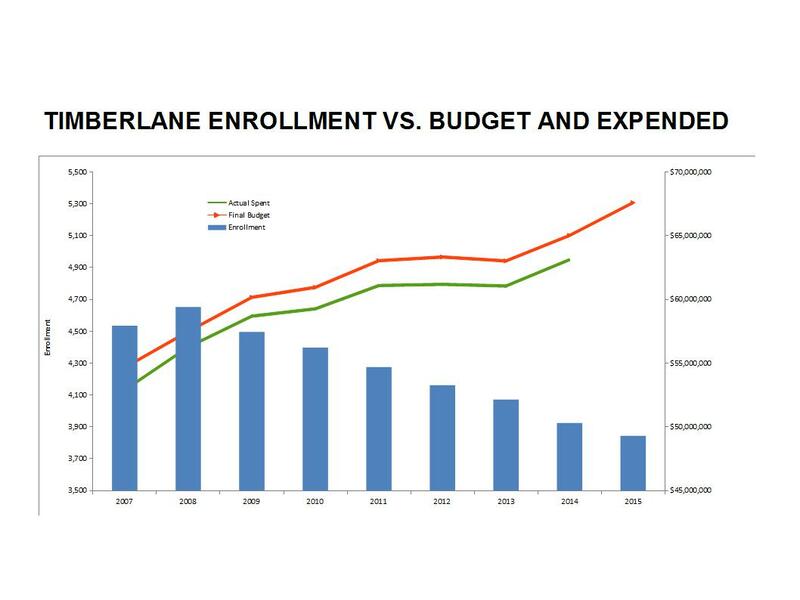 Blue bars are enrollment, red line is budget, green line is what was expended. 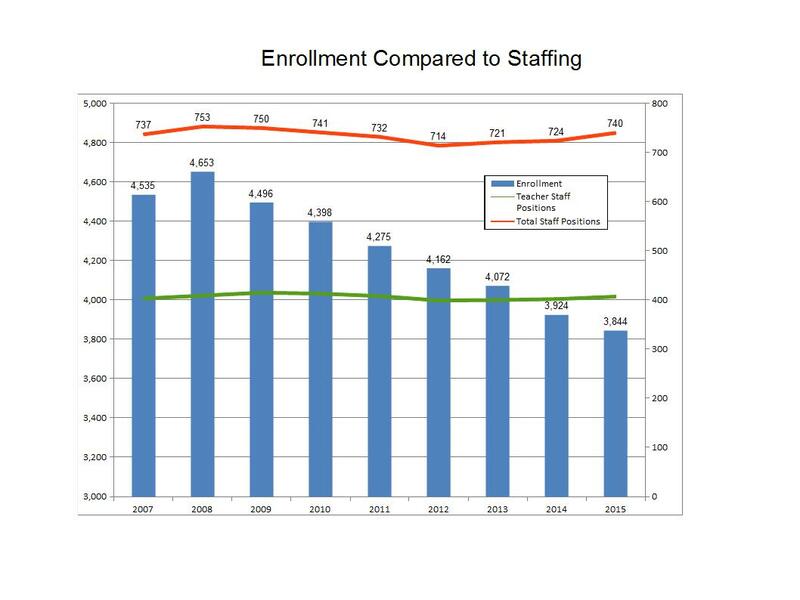 The chart above shows total district positions in red vs. teaching staff in green, enrollment represented by blue bars, again from 2007 to 2015, using the administration’s own enrollment projection for 2015. All information for both these charts sourced exclusively from the Timberlane school district. See anything wrong with these pictures? For more, attend school deliberative on Thursday night. 7 pm at the PAC. There will be ten slides in total and not one will mention tax rates. Veil Lifted: Sandown School taxes up 19% in two years? Exactly one business day after candidate registration closed, the SAU revealed “draft” tax rates for the school district’s four towns. Danville will be the hardest hit with a “draft” increase of 9.5%. Sandown is 8.7%. If the proposed school budget goes through unchanged, the projected total school tax increase in two years for Sandown will be 19%. Danville will be 15%. IN JUST IN TWO YEARS! Perhaps with all the improvements going on in the district with their “respectful” budget increases, the library has digitized its copy of The Goose that Laid the Golden Egg, leaving only the story of Chicken Little in the administrator’s break room. The sky will fall if the 4% increase doesn’t pass! This blog had been predicting a 7.8% school tax increase for Sandown and a 6.6% increase for Danville if the proposed school budget gets passed unchanged. The “draft” tax reality is considerably worse. Voting for the default budget will give hardly any relief. The only hope you have of peeling back this outrageous tax increase is to vote to lower the district’s budget at school deliberative on Thursday at 7 pm, at the PAC. The timing of the “draft” release is interesting. Dr. Metzler, Mr. Stokinger, Mr. Collins, school board chairman, and Joe Morris, Sandown rep, attended the Sandown Board of Selectmen meeting last night. They brought with them the “draft” tax rate at my prompting. This revelation just happened to be after anyone could challenge Mr. Collins on the ballot for his seat on school board. He is running for re-election in Danville – unopposed. Tax rates are subject to a little change as they depend on both the town and district revenues and student population of the towns, all of which could change somewhat from the draft, but don’t hold out false hope. The district has been doing these estimates for a long time. Vote at the PAC on Thursday night to lower this proposed budget, or dig out your old children’s books. You won’t have the money to buy any new ones.